Fire Weather Observations are collected and maintained according to standards established in the Interagency Wildland Fire Weather Station Standards and Guidelines, PMS 426-3. LAL 2 Isolated thunderstorms. Light rain will occasionally reach the ground. Lightning is very infrequent, 1-5 cloud-to-ground strikes in a five minute period. Widely scattered thunderstorms. Light to moderate rain will reach the ground. Lightning is infrequent, 6-10 cloud-to-ground strikes in a five minute period. LAL 4 Scattered thunderstorms. Moderate rain is commonly produced. Lightning is frequent, 11-15 cloud-to-ground strikes in a five minute period. LAL 5 Numerous thunderstorms. Rainfall is moderate to heavy. Lightning is frequent and intense, greater than 15 cloud-to-ground strikes in a five minute period. LAL 6 Same as LAL 3 except thunderstorms are dry (no rain reaches the ground). This type of lightning has the potential for extreme fire activity and is normally highlighted in fire weather forecasts with a Red Flag Warning. The Ignition Component is a rating of the probability that a firebrand will cause a fire requiring suppression action. Expressed as a probability; it ranges on a scale of zero to 100. An IC of 100 means that every firebrand will cause an actionable fire if it contacts a receptive fuel. Likewise, an IC of zero would mean that no firebrand would cause an actionable fire under those conditions. Note the emphasis is on action. The Spread Component is a rating of the forward rate of spread of a headfire. Deeming, et al (1977), states that, “the Spread Component is numerically equal to the theoretical ideal rate of spread expressed in feet-per-minute. Highly variable from day to day, the Spread Component is expressed on an open-ended scale; thus it has no upper limit." The Energy Release Component is a number related to the available energy, BTU per unit area square foot, within the flaming front at the head of a fire. Daily variations in ERC are due to changes in moisture content of the various fuels present, both live and dead. Since this number represents the potential heat release per unit area in the flaming zone, it can provide guidance to several important fire activities. It may also be considered a composite fuel moisture value as it reflects the contribution that all live and dead fuels offer to potential fire intensity. It should also be pointed out that the ERC is a cumulative or build-up type of index. As live fuels cure and dead fuels dry, the ERC values get higher thus providing a good reflection of drought conditions. The scale is open-ended or unlimited and, as with other NFDRS components, is relative. Conditions producing an ERC value of 24 represent a potential heat release twice that of conditions resulting in an ERC value of 12. As a reflection of its composite fuel moisture nature, the ERC becomes a relatively stable evaluation tool for planning decisions that might need to be made 24 to 72 hours ahead of an expected fire decision or action. Since wind does not influence the ERC calculation, the daily variation will be relatively small. The 1000 hour time lag fuel moisture (TLFM) is a primary entry into the ERC calculation through its effect on both living and dead fuel moisture inputs. There may be a tendency to use the 1000 hour TLFM as a separate index for drought considerations. A word of caution – any use of the 1000-hour TLFM as a separate index must be preceded by an analysis of historical fire weather data to identify critical levels of 1000 hour TLFM. A better tool for measurement of drought conditions is the ERC since it considers both dead and live fuel moistures. The Burning Index is a number related to the contribution of fire behavior to the effort of containing a fire. The BI is derived from a combination of Spread and Energy Release Components. It is expressed as a numeric value closely related to the flame length in feet multiplied by ten. The scale is open ended which allows the range of numbers to adequately define fire problems, even in time of low to moderate fire danger. It’s important to remember that computed BI values represent the near upper limit to be expected on the rating area. In other words, if a fire occurs in the worst fuel, weather, and topography conditions of the rating area, then these numbers indicate its expected fireline intensities and flame length. Studies have indicated that difficulty of containment is not directly proportional to flame length alone but rather to fireline intensity; the rate of heat release per unit length of fireline (Byram 1959). The use of fireline intensity as a measure of difficulty shows that the containment job increases more than twice as fast as BI values increase. It is still safe to say that flame length is related to fireline intensity because BI is based on flame length. The Lightning Occurrence Index is a numerical rating of the potential occurrence of lightning-caused fires. It is intended to reflect the number of lightning caused fires one could expect on any given day. The Lightning Occurrence is scaled such that a LOI value of 100 represents a potential of 10 fires per million acres. It is derived from a combination of Lightning Activity Level (LAL) and Ignition Component. To effectively develop this index the user must perform an extensive analysis to develop a local relationship between thunderstorm activity level and number of actual fire starts that result. Since our ability to accurately quantify thunderstorm intensity is limited it is difficult to develop a relationship between activity and fire starts. Thus the Lightning Occurrence Index is seldom used in fire management decisions. Local fire managers should monitor the lightning activity level provided by the National Weather Service, and with a little experience can develop their own rating of lightning fire potential. This is a numeric rating of the potential occurrence of human-caused fires. Similar to the Lightning Occurrence Index, this value is intended to reflect the number of human-caused fires one could expect on any given day. It is derived from a measure of daily human activity and its associated fire start potential, the human caused fire risk input, and the ignition component. The MCOI is scaled such that the number is equal to ten times the number of fires expected that day per million acres. An index value of 20 represents a potential of teo human caused fires per million acres that day if the fuel bed was receptive for ignition. The original developers of the National Fire Danger Rating System recognized that where the total fires per million acres average twenty or fewer, the evaluations are questionable. This has been validated through application. As with the Lightning Occurrence Index, the Human-caused Fire Occurrence Index requires considerable analysis to establish a local relationship between the level of human activity and fire starts. Since human activity is fairly constant throughout the season and human-caused fire occurrence in, for example, the Pacific Northwest, is relatively low in terms of fires per million acres per day, most analyses result in very low risk inputs that don’t change much from day to day. Few fire managers, if any, are using this index in making day-to-day decisions. Fire Load Index is a rating of the maximum effort required to contain all probable fires occurring within a rating area during the rating period. The FLI was designed to be the end product of the NFDRS – the basic preparedness or strength-of-force pre-suppression index for an administrative unit. It was to be used to set the readiness level for the unit. It focuses attention upon the total fire containment problem. Because the FLI is a composite of the various components and indexes of the NFDRS, including the local lightning and human caused fire risk inputs, the comparability of values varied significantly from one unit to another. To be useful managers must establish the relationship between the FLI calculated for their unit and the true fire containment effort needed. The FLI is represented as a number on a scale of 1-100. It provides no specific information as to the nature of the potential fire problem as individual indexes and components do. Because the Fire Load Index is a composite of several pieces of the NFDRS, its utility is impacted by of the inherent weaknesses of the individual components and indexes. Very few fire management decisions are made based on the Fire Load Index alone. This index is not an output of the National Fire Danger Rating System itself but is often displayed by the processors used to calculate NFDRS outputs. KBDI is a stand-alone index that can be used to measure the effects of seasonal drought on fire potential. The actual numeric value of the index is an estimate of the amount of precipitation (in 100ths of inches) needed to bring the soil back to saturation (a value of zero is complete saturation of the soil). Since the index only deals with the top eight inches of the soil profile, the maximum KBDI value of 800 or 8.00 inches of precipitation would be needed to bring the soil back to saturation. The Keetch-Byram Drought Index’s relationship to fire danger is that as the index value increases, the vegetation is subjected to increased stress due to moisture deficiency. At higher values desiccation occurs and live plant material is added to the dead fuel loading on the site. Also an increasing portion of the duff/litter layer becomes available fuel at higher index values. If you are using the 1978 fuel models, KBDI values can be used in conjunction with the National Fire Danger Rating System outputs to aid decision making. If you are using the modified NFDRS fuel models that were developed in 1988, KBDI values are a required input to calculate daily NFDRS outputs. Since most fire danger stations are not being operated when the soil is in a saturated condition, it is necessary to estimate what the KBDI value is when daily observations are began. The technical documentation describing the KBDI includes methodology to estimate the initiating value and is included in the attached reference list. Most processors include a default initiation value of 100. WFAS provides public access to standard Fire Potential/Danger depictions, Fire Weather information, Fuel Moisture/Drought products, and assorted Experimental Products produced by the Rocky Mountain Research Station’s Fire, Fuel and Smoke Science Program. Operating with fire weather observations from WIMS (4.3.4), gridded forecasts from NWS National Digital Forecast Database (NDFD), and gridded fire danger climatology dating to 1979. NAP Access Portal requires login and provides authorized access for management of RAWS station catalogs, observations, NFDRS calculations, and source data for other portals such as the Enterprise Geospatial Portal (EGP) and Wildland Fire Assessment System (WFAS). FAM-IT Portal provides access to background, instructions, standards, and approved cards throughout the US. 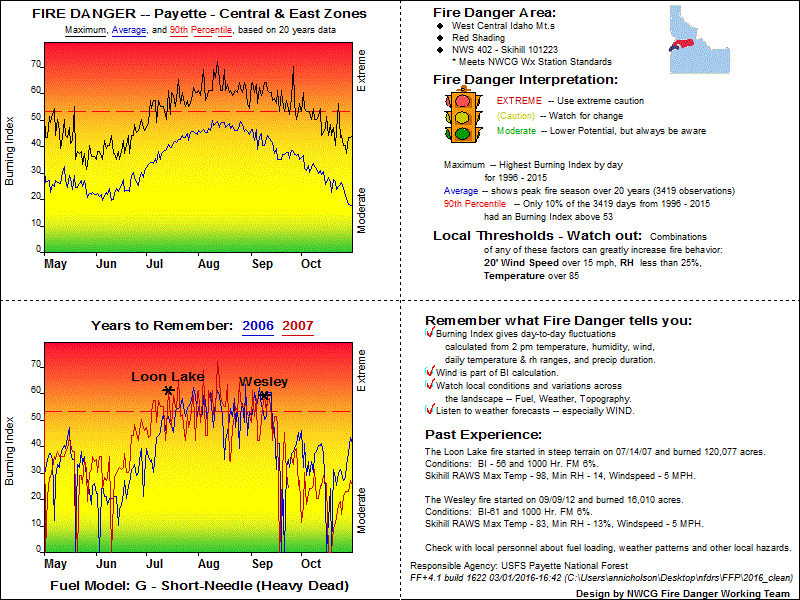 The Fire Danger Pocket Card provides a format for interpreting and communicating key index values provided by the National Fire Danger Rating System. The objective is to lead to greater awareness of fire danger and subsequently increased firefighter safety. The Pocket Card provides a description of seasonal changes in fire danger in a local area. It is useful to both local and out-of-area firefighters. The Pocket Card has very important day-to-day pre-suppression uses. When the morning and afternoon weather is read each day, the actual and predicted indices are announced. Firefighters can reference their card and assess where today falls in the range of historical values for danger-rating. This important information should be discussed at morning crew meetings, tailgate safety meetings, incident briefings, etc.